There are 4 types of foreign material to convert to A&D material. Here you can decide if you want to convert all materials in a scene or only materials from selected objects. Activates the VRay conversion, in which colors, reflections and refractions are applied. Is compatibel with Vray 2.x: VrayMaterial, Vray2sided, VrayBlend, VraySimbiont, VrayOverride, VrayFastSSS, VrayFastSSS2, VrayHair, VrayLight and VrayWrapper. Activates the DGS, Standard, Raytrace and Architectural Material conversion, in which colors, reflections and refractions are applied. put a TH-Generic as copy from A&D Material in the Shadow Slot of the mental ray connection. Activates the A&D Material conversion to iRay Material, in which all Parameteters are applied. Activates the MetaSL conversion. This convert a MetaSL Material to a TH-Material with all Parameters. Activates the TH-Material conversion. This convert a TH-Material to a MetaSL Material with all Parameters. Actviate Values to adjust the shaders. Remove all incompatible Maps, for example the Vray-Maps. R-Button remove all Autodeks Map. Remove all Autodeks Map. Good to clean imported Scenes from Revit. Remove Layer by Wirecolor, Remove Blocks …. This Function need you bevor you convert all Material in a Scene. Reset Material Edtior to A&D Material. The Sample Curve serves to create a continuous distribution of the Glossy Reflection/Refraction Samples. On the basis of the Glossy + Anisotropy values, the sample quantity is calculated. As a result, there isn’t any more material that has too few (grainy) or too many samples (longer render time). 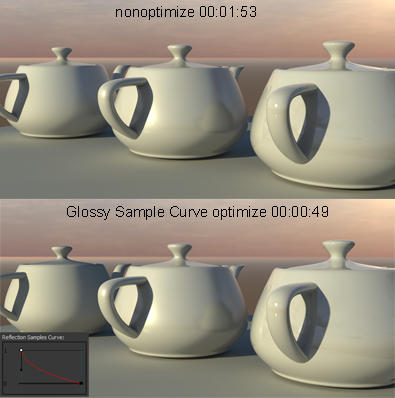 Imported objects receive the existing shading quality of the scene instantly. For this there are again two limit values with which one can substantially shorten the rendering time. Threshold Zero-Samples: the sharper a reflection is, the fewer the samples one needs. Therefore, starting at a certain glossy sharpness, the number of samples is set to 0. Threshold No-Refraction: the more spread out a reflection is, the more samples one needs. Starting at a certain diffusion value, one can barely perceive the reflection. In this case, the reflection is turned off if the glossy value of the material falls below the limit value. When you have a map in the glossiness channel, the glossiness value should correspond to the darkest shade of the Map because the Samples Curve process doesn’t analyze the map/picture. Furthermore, the Glossiness-Map should never contain the color black (o,o,o) since this will simulate a never ending distribution and will lead to grainy flaws. Real specular Light create a harmonic Energy of speculare Lights. Normaly is the Highlights a fake and it is not real. In the Reality is this a reflection of a real Light. When both Functions is „on“, have you double speculares Lights. Please look to the example of Anderson Jacobsen. The Option“real Specular Light“ looks how strong is the Reflection of the Materials and decrease the not real specular Light of the Material ( A&D => hlighlight_vs_reflection_balance). Reflectivity_Value + hlighlight_vs_reflection_balance = 1. The Function is for scenes with area Light. This Button activate the Fast Interpolation calculation to optimize the main Samples. This activate the Sample Curve Technology for all Button. 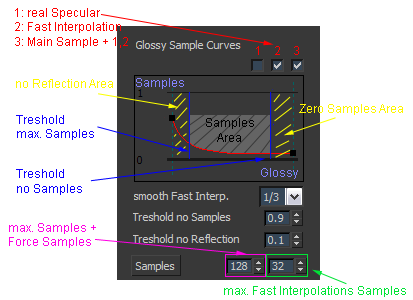 The Sample Curve serves to create a continuous distribution of Main Samples and Fast Interpolation Samples. Set the intensity Grid. Higer Values create smooth Reflections. Activate The Button for the heuristic mode, to setup the Grid size automaticly. New is „Fastinterpolation density“. Bevor had calculate SU Pro the Fastinterpolation at all Materials. The Result was, that sharp Reflection are too smooth, for exampla Chrome. Fast Interpolation is only goos have the Material enough main Samples. The Density-Value is divide with max. Main Samplevalue, for exsample 64/3 = 21,33. Fastinterpolation is only activate, have the Material more as 21 Main Samples. The Result is, that sharp Reflection have no Fast Interpolation. Shows the Limitglossy value of the reflection. If the value is >= that of the materials, the material will receive 0 samples. Shows the Limitglossy value of the reflection. If the value is <= that of the materials, the reflection of the material will be deactivated. Shows the maximum number of Samples for the Samples Curve process. If Sample Curve deaktivate, have all Shading this Value as Force Sample. Shows the maximum number of Samples for the Samples Curve process.If Sample Curve deaktivate, have all Shading this Value as Force Sample. With the help of these functions, you can very quickly assign the Brightness FG/GI and Quality of FG Rays on the basis of the 3 selection criteria. All materials receive the FG Multiply value. Shows the FG Multiply value. All materials receive the FG Quality value. Shows the FG Quality value. With the help of these functions, you can very quickly assign the cutoff value of reflection and refraction on the basis of the 3 selection criteria. The cutoff value allows the cutting off of the reflection or refraction starting at a certain value. This value should be between 0.005 and 0.001. If the value is 0, 100% will be reflected or refracted, and the memory increase. 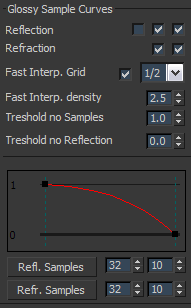 If „Reflection DT“ enable, set the Material to Reflection Depth=1, if the Reflection glossiness Value of the material lower as the Treshold Value. This can help to eliminate Sample Errors on very diffuse reflectiv Materials. Shows the reflection cutoff value. 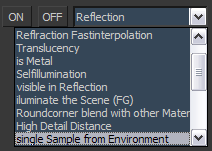 If „Refraction DT“ enable, set the Material to Reflection Depth=1, if the Refraction glossiness Value of the material lower as the Treshold Value. This can help to eliminate Sample Errors on very diffuse refractiv Materials in other reflection. Set the Value. Range is from 0 to 1. Shows the refraction cutoff value. Shows the Reflection Depth value. Shows the Refraction Depth value. Select a Option of the List and set „on“ or „off“, for example Reflection or Back Face Culling. It is supported all Options of a A&D Material. 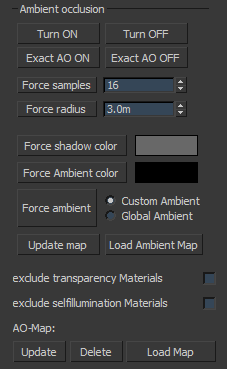 Diffuse Image Fade, only at TH-Materials to hidden empty Autodesk Maps from importet Revit Scenes. This Function are helpful to optimize the hole scene with ambient occlsuion. Activates the Ambient occlusion of the material. Deactivates the Ambient occlusion of the material. Activates exact AO. In this mode, the shadow receives the color of the occluded object. As a result, there aren’t any dark parts around self-luminous objects. Deactivates exact AO. The shadows receive the color of „shadow color“ parameters. When the AO Sample Curve is deactivated, all materials receive the same Force Sample value. Shows the number of Samples Force/Main Samples. All materials receive the Force Radius value. All materials of the AO shadow color. Uses this color as AO shadow when exact AO is deactivated. All materials receive the AO ambient color. Uses this color as AO ambient light. With this you can brighten the inner values as well as the ambient of the materials without additional lights. Activates the AO Sample Cure process. Shows the maximum number of samples for the Samples Curve process. Shows the maximum distance for the Samples Curve process. Shows the minimum distance for the Samples Curve process. With the help of these functions, you can very quickly exchange a Environment Map with materials as well globally assign them on the basis of the 3 selection criteria. Updates the loaded Environment Map. Loads an Environment Map of your choice. ith the help of these functions, you can very quickly distribute the radius for rounded corners on the basis of the 3 selection criteria. Resets the radius for Round Corner. Shows the radius as well as the size of the rounded corners of the objects. With the help of these functions, you can very quickly optimize the Bitmap blur and Filtering Mode. set the Bitmapblur Amount for the hole Scene. Value 1 is good for animation and Value 0,1 is good for stills. set the Filteringmode for the hole Scene. if you use trees or plants,can this option speedup your rendering.